Hi friends! It's Sunday and that means time for a new challenge at The Paper Players. 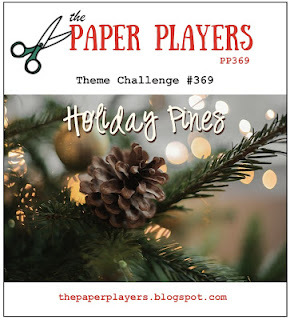 This week the wonderful and talented LeAnne is our hostess with a theme challenge, Holiday Pines. 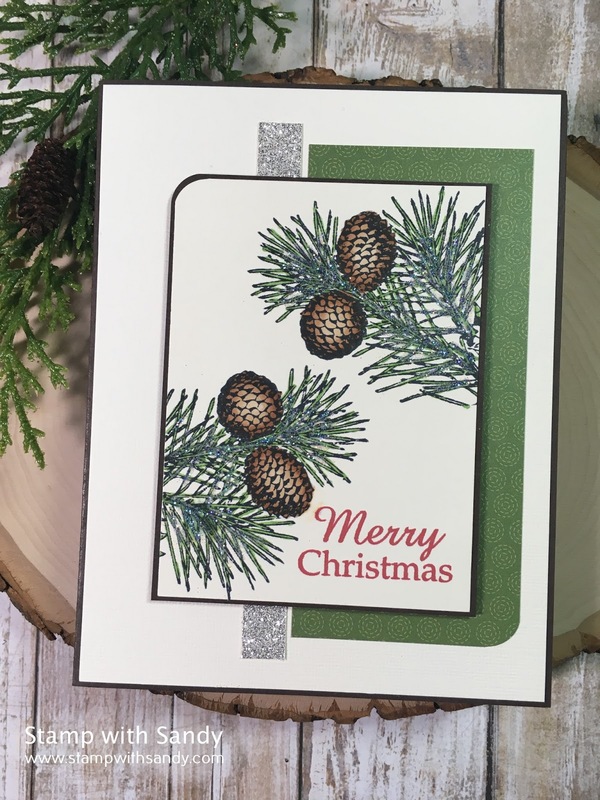 I love this challenge and couldn't wait to dive in to my stamps to look for pine cones! I went through my stamp stash a found a few sets with pine cones, but settled on this one from Technique Tuesday. There is also a larger pine cone in this stamp, but I stamped it off the edge and focused on the smaller cones. I colored the images with Copics, though in retrospect I think it would have been much easier with colored pencils. Those pine needles are so tiny! 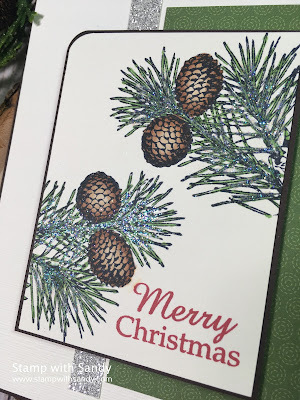 Though I tend to be a glitter phobe I thought they needed some sparkle so I frosted them with glitter, thoroughly cleaned my craft space, then quarantined my card in a clear envelope! Happy Sunday Sandy. This card is very realistic. Looks so neat. Once again, you did a great job in coloring. Your glitter phobia cracks me up! Your card is gorgeous. The coloring and shading look so very realistic as if I just pluck the pine cones off the branch. Perfectly balanced and I love the pop of the red sentiment. Great layout too--would make a fab paper players sketch ;-)! I love the glitter on the pines...so fun! Now that holidays are near,I'll be glittering everything!Such a pretty card!!! I am so thrilled you used glitter on these beautiful branches, even if you did have to quarantine afterwards! Just gorgeous, and so realistic! I can smell the pines all the way to PA! Such pretty pine cones! You are brave using glitter - even with quarantine, I find mine gets everywhere! I do love that little strip of silver glimmer in behind as it really brings out the bling on the pines. Lovely, lovely card. Wonderful pines and cones - they look so real!! Glad you broke out the glitter! Hope you're having a great week! The added glitter is the perfect touch! Stunning!